Responsible Tourism: Using tourism for sustainable development 2nd edition is about the globally vital necessity of realising sustainable tourism. It is a hugely important challenge to those who organise and sell travel and tourism, and those who consume it. Now in its second edition, it has been fully revised and updated and includes new material to explore the following key issues: resilience, voluntourism, child protection, the challenge of disintermediation, tourism and the UN Sustainable Development Goals, slum tourism, shared value and animal welfare. Harold Goodwin, Director of the Institute of Place Management at Manchester Metropolitan University and Managing Director of the Responsible Tourism Partnership. "This is a vitally important book for academics, practitioners and policy makers. It eschews some of the formality of conventional academic publishing in order to strengthen and clarify the arguments about the concept of taking responsibility for tourism and its effects. The author uses his vast experience in this area to good effect, making a powerful argument about the ways in which we should manage and develop tourism and deal with this powerful force. This volume represents a powerful and articulate argument about the issues resulting from tourism's expansion into all parts of the world and presents a strong case about how we might manage the challenges which result from this development. It should be mandatory reading for all those interested in, studying, and producing policy relating to tourism development. It draws on the author's vast experience in studying the effects of tourism on environments and peoples and expresses clearly his challenging views on appropriate management procedures." "Krippendorf and now Goodwin are the architects of modern responsible tourism. A challenging and inspiring read that defines the agenda for the next decade." "Harold Goodwin’s book is a much-needed piece of research that goes to the heart of the development of what has become known as responsible tourism. It combines solid research and academic precision with the fluency and persuasion that make it an enlightening and absorbing read - of interest to the travelling public and research student alike. That an increasing number of specialist travel companies now place such responsibility as an automatic part of the commercial process is, in no short measure, due to Goodwin’s thinking." '''Richard Hearn, Chair (2005-6), Association of Independent Tour Operators (AITO). Part One: Introduction: Why Responsible Tourism? 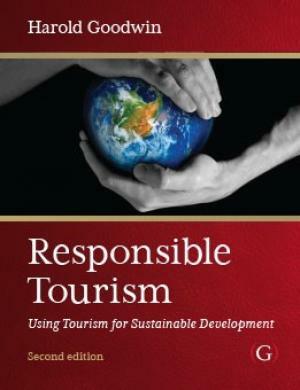 Chapter 1 What is Responsible Tourism? Harold Goodwin, is Director of the Institute of Place Management at Manchester Metropolitan University and Managing Director of the Responsible Tourism Partnership.